The first new rule since 2001 from the U.S. Environmental Protection Agency to reduce smog-forming pollution from heavy-duty trucks was positively received by the trucking industry and EPA critics. The announcement of the agency’s Cleaner Trucks Initiative to further decrease nitrogen oxide, or NOx emissions, follows a December 2016 petition from more than 20 state and local air agencies and environmental groups. NOx is a poisonous gas produced when fuel is burned at high temperatures. “Updating these standards will result in NOx reductions from mobile sources and could be one important way that allows areas across the U.S. to meet National Ambient Air Quality standards for ozone and particulate matter,” the EPA said. The agency said it would work with stakeholders, including the California Air Resources Board, truck and engine manufacturers, technology suppliers and truck fleets, on the new rules. The agency expects to publish a proposed rule in 2020 with implementation in 2024. The EPA wants to create a 50-state standard, which would make it easier for manufacturers to comply with regulations. California, which has tougher laws for several types of pollution than the federal government, has begun a public process to set new state emission limits. A proposal is expected next year. The American Trucking Associations “strongly favors a single national emission pathway as opposed to a patchwork of state standards,” the trade group said in a statement. NOx emissions dropped by more than 40 percent from 2007 to 2017, the EPA said. Much of that reduction was due to the introduction of low-sulfur diesel fuel and diesel particulate filters that trap and break down particulates before they are released as exhaust into the air. A study from the Health Effects Institute said the filters reduced particulate matter emissions by 90 percent, and selective catalytic-reduction systems reduced smog-forming NOx emissions by 94 percent in trucks equipped with those technologies. 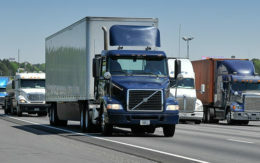 About 36 percent of diesel-powered commercial vehicles have the technologies, according to the Diesel Technology Forum. “The Cleaner Trucks Initiative will help bring today’s generation of advanced diesel technology nearer to zero emissions than ever,” the group said in a statement. Still, the EPA estimated that heavy-duty trucks would account for a third of NOx emissions from the transportation sector in 2025. The Cleaner Trucks Initiative surprised environmental groups critical of the EPA, which has rolled back numerous regulations on air quality during the administration of President Donald Trump. Earlier this year, the EPA backed down on a plan to lift the production cap on so-called glider trucks. Gliders are new truck bodies mated with older, high-polluting engines that release as much as 40 times the NOx into the air as newer trucks. Attorneys general in 18 states and environmental groups sued to get acting EPA Administrator Andrew Wheeler to reverse the decision. Wheeler put the decision on hold before a court hearing. “Given its sorry overall record in protecting public health, we will be watching closely to make sure the agency follows through the needed cuts in these smog-forming compounds and actually mandates,” said Luke Tonachel, director for clean vehicles and fuels at the Natural Resources Defense Council. “There’s ample reason for skepticism,” Tonachel said.